The mothers of Isabel have united to protect their land and the sea. Moira Dasipio (right), President, Mothers Union, Isabel Province, Solomon Islands. Moira never dreamed of becoming a chief as a child. She grew up going to church every day and every night, singing songs, and even writing some of her own. Like other girls in her village, she would garden and collect shells, and she would grow up to marry her husband and have four children. She worked in the kitchen and washed her family’s clothes. She would tend to her garden bed of potatoes and cassava vegetables, and brightly coloured pink and purple flowers, and plants from the jungle with orange, red and green leaves. She would grow to eventually write songs about the roles of men and women, how the men would go fishing and how the birds would follow, and how the women cared for the children and worried over their future. 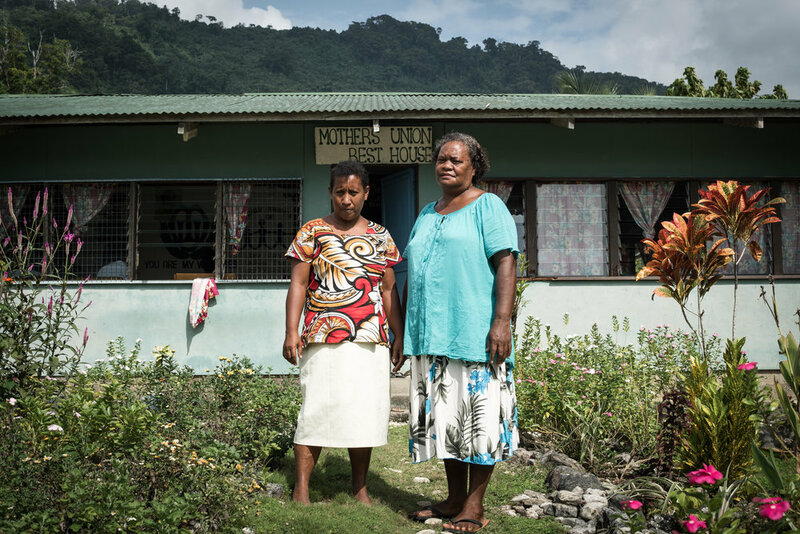 She was happy to lead the traditional life of a woman, caring for her children, until one day Moira was selected to become an elder chief of Kia on Isabel in the Solomon Islands. She never asked for the role. To be honest she was frightened. Map to Paradise Co-Director, Danielle Ryan, talking to a group of young girls to find out what life is like for females growing up on the island of Isabel. She was not sure if she could be a good leader. She felt she belonged in the kitchen. The council of chiefs refused to listen to her protests. They had been watching her, and wanted her for the role. They told Moira to rid herself of these fears, because she had been elected. She was now one of eleven chiefs from her village, and had been appointed as a leader of women and so, in an instant, her childhood vision of what her life would be like as a grown woman had vanished. She would become the President of the Mothers Union, and would lead the women of Isabel to do many good things – although it was not easy. She would have to spend time away from Kia, her husband and her dear children. When she left, she made sure her children understood that everything she was doing was for them. There was the time she left on a journey to travel by boat and by truck up and down many jungle-covered coastlines and roads that wove around and through mountains. She was on a mission to talk to every household about malaria, because people were dying, including the children. Whole villages were becoming ill. The mosquitoes were taking over. So, together, with the mothers of the island, Moira armed herself with piles of mosquito nets and the knowledge necessary to combat the viral spread of malaria. She made sure the mothers reached every corner of the island, and eventually the virus began to disappear. This wise mother of Isabel had learned the secret of how to shift society’s behaviour in way that could save lives. Better yet, this journey was just the beginning. Around the time that she was still learning how to lead her people, foreigners came and taught her about ‘conservation.’ She did not know what this word meant at the time, but Moira listened and watched. Then, one day, everything suddenly made sense. The meaning of this word, ‘conservation,’ became clear to her. ‘Conservation’ was the way her great grandfather and her ancestors used to manage the land and sea. The Mothers Union is concerned about the resource sector and the impact it has on the environment. Until recently, women have been left out of the decision-making process when it comes to managing the land and sea. Once upon a time, there were rules about where you could go and fish or take from the land. These rules applied until the creep of the modern world destroyed this old way of life. It was during the 1970s, when loggers came to Isabel, that the peace of the community began to change – and the meaning of ‘conservation’. Her peoples’ traditional way of life slowly began to disappear. People from local tribes also began to challenge ownership of the land. As a mother, she noticed that as time moved on, the ocean was also being plundered, and that the men would just fish and fish to feed their family today without thinking about tomorrow. She would help sow the seeds of the beginning of a movement to protect the sea and land around her island home. So, again, she went on a journey, leaving her home of Kia, her husband and her children. There was a new virus she had to stop – mining fever. The lure of riches. Foreign miners were now arriving on the island in helicopters, tempting bush folk with trips to Honiara and cash, in exchange for a simple signature on a dotted line. She had lived through the era of logging and had heard tales of what happens to the land and the sea when places turn into mining towns, churning up dirt and leaving nothing more than dust behind. So, again, elder chief Moira, accompanied by a group of women from the Mothers Union, travelled up and down the jungle-covered mountains and coastline talking to every household in the villages and in the bush – but this time, she talked about the importance of conserving the land and the sea. Haevo, the first community-led marine protected area established on Isabel, Solomon Islands. Every step Moira took was for the future of her children and for everyone’s children and, eventually, those twenty years of hard work paid off. About four years ago, the small village, Haevo, on Isabel became the first community-led village to protect its coastal waters and land to care for the critically endangered leatherback turtle. They thanked Moira for shining a light on the way to go – and that makes Moira happy. And, only the week before we filmed Moira in May 2017, the Solomon Islands Government declared the country’s first national park on the land and the sea as ‘officially open’. This protected area is located in the Arnavon Islands, a tiny chain of islands dwarfed by Isabel. The first underwater photograph ever taken of Haevo's marine protected area. (We were delighted to discover a blossoming reef of healthy corals inside the sanctury). The proud people of Isabel own these illustrious islands brimming with birds, fish and turtles. It is a rather incredible feat, in a community of a couple of thousand people, for all of them to agree that national law should protect this place. The consent of every tribal landowner is required to make conservation work in the Solomon Islands and, so often, conservation fails when just one or two people decide to contest. However, not today – the mothers of Isabel have discovered the secret to restoring the paradise their people once enjoyed. Phil (left), Justin (middle) & Brian (right), proud rangers of Haevo. (At Haevo, we stayed at Justin's home stay. As Haevo is an undiscovered tourism destination, we soon discovered we were Justin's first guests. He made every effort to make us feel comfortable and welcome).